St Kilda were competitive in the first half against North Melbourne. 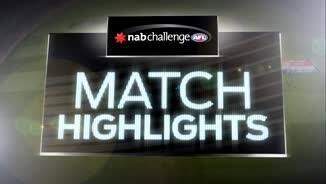 But, North Melbourne's dominance in the clearances proved the difference in the second half with five goals to two from this source. Mason Wood has been a potent target up forward with four goal, whilst Jack Ziebell continues to dominate the stoppages with ten clearances. Three of North Melbourne's four scores this quarter have been generated in the forward 50. Since halftime, St Kilda's key forwards Bruce and Lee have combined for 4 disposals and just one goal. 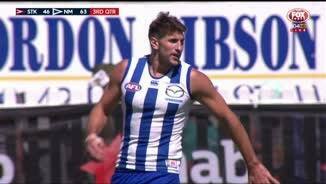 Conversely, Jarrad Waite and Drew Petrie have had five marks inside 50 and nine score involvements. North Melbourne has had a major advantage in stoppage situations. They have won ten more clearances and convered these into two more goals from this source than St Kilda. Since halftime, North Melbourne has applied 8 more tackles than St Kilda and as a result their kicking efficiency is 13 per cent greater. 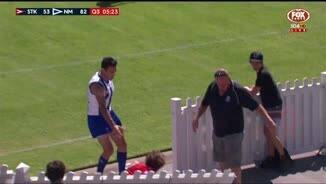 Shaun Atley has had a huge impact with his run and carry for North Melbourne. He has 15 disposals at 100 per cent efficiency, ten handball receives and five score involvements. St Kilda's kicking efficiency has let them down in the second half. Particularly in the forward half, where It is just 29 per cent and has resulted North Melbourne generating five goals from the defensive half. North Melbourne has the last six goals of the match. Whilst, North Melbourne have been dominant in aerial contests with ten more contested marks than St Kilda. Although St Kilda has created five inside 50's, their disposal efficiency has dropped to just 53 per cent. As a result, North Melbourne has converted two turnovers from their defensive midfield into scores. North Melbourne have been able to find targets inside 50. They have six marks inside 50 to St Kilda's two. Drew Petrie has three of those as well as five score involvements. St Kilda are working hard defensively, they have eleven players with an intercept possession in their defensive 50. However, all three of their turnovers in their defensive midfield have been punished by three goals from North Melbourne. That is the second goal North Melbourne has launched from an intercept in their defensive 50. In 2015, they were ranked number one in the league for generating scores from this zone. It has been a quarter with several changes in momentum. St Kilda had the first six scores, however North have been dominant since with the last three goals all from intercepts. Shaun Higgins has arguably been the most influential player on the ground. He has a game high eight contested possessions, five clearances and four score involvements. 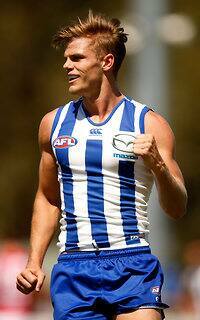 North Melbourne InterchangeJed Anderson replaces Jarrad Waite due to the blood rule. North Melbourne have their sixth contested mark for the half, which they have generated two goals from. Drew Petries has two of those and continues his good form against the Saints, after taking six in the round 20 clash last year. Sebastien Ross has been influential in the first eleven minutes of the quarter. He has amassed seven disposals, three clearances and applied two tackles. St Kilda now has the last six scores. Since the start of the quarter, St Kilda's disposal efficiency has been extremely high at 83 per cent and they have been winning the disposal count 32 to 6. St Kilda has won the first four center clearances of the quarter. They have now generated a score from 71 per cent of centre clearances. Last season, they generated a score from just 10 per cent of centre bounces. St Kilda has applied seven tackles in their defensive 50. As a result of this pressure, they have created seven intercept possessions and have limited North Melbourne to five goals from seventeen inside 50's. In that quarter, North Melbourne created six of their seven scores from possessions in the forward half of their midfield. In 2015, they were ranked second in the league in scoring from this zone. Despite losing the centre clearances five to two, St Kilda has managed to generate a score from both these clearances. This is as a result of their kicking efficiency, which is 14 per cent greater than North Melbourne in the forward half. Shaun Higgins already has four contested possessions, three clearances, a goal and another score involvement. St Kilda's disposal efficiency is 76 per cent compared to North Melbourne's, which is just 53 per cent. Whilst, St Kilda has intercepted ten of North Melbourne's possessions. These intercepts have generated two scores. North Melbourne continue to lead the clearances by five and have created three inside 50's from this source. However, St Kilda has had five intercept possessions in their defensive half resulting in one goal being created from this source. North Melbourne have won six of the first seven clearances, including the clearance resulting in that goal to Shaun Higgins. 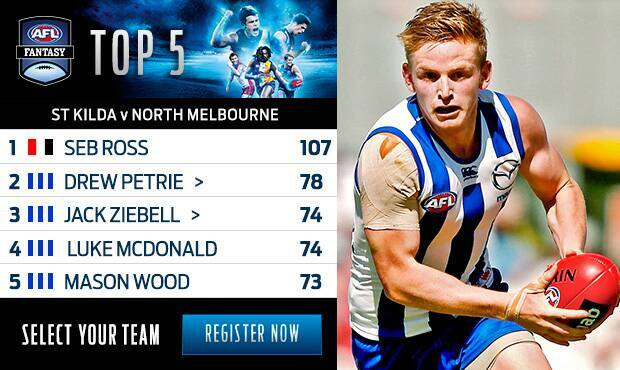 Jack Ziebell has three of those six. St Kilda have lost 5 of their last six preseason matches by an average margin of 38 points. Last year, St Kilda were ranked last in contested marks and third last in creating Inside 50's during the NAB Challenge. Since 2011, North Melbourne has won the last four meetings with St Kilda. Prior to that, St Kilda had won six of the last seven matches between the two sides. Welcome to Norm Minns Oval for the St Kilda v North Melbourne Round 1 clash. TWIN towers Drew Petrie and Jarrad Waite signalled they are still forces to be reckoned with and young teammate Mason Wood had a breakout game as North Melbourne's forwards carried it to a 44-point over St Kilda at Norm Minns Oval in Wangaratta on Saturday. Petrie and Wood each kicked four goals and Waite three as the Roos' attack overpowered the Saints' defence in the 18.9 (117) to 1.9.10 (73) win. Wood's performance was significant and could be a sign he is finally ready to cement a senior spot in his fourth AFL season. Both teams had injury scares in the first quarter when Saints forward Paddy McCartin and North small Kayne Turner went off with hamstring injuries. Neither played any further part in the match but both injuries appear to be minor. St Kilda coach Alan Richardson told Fox Footy at half-time that McCartin had "given his hamstring a bit of a tweak" but said the Saints had taken a "pretty cautious and conservative" approach by resting him. North tweeted that Turner had suffered no more than "minor hamstring tightness". Roos fans would have been buoyed by the promising debuts of 2015 draftee Ryan Clarke and former Hawk Jed Anderson, while first-year forward Corey Wagner was good in patches. The Saints have high hopes for Jade Gresham, their first pick in last year's national draft at No.18 overall, and the speedy midfielder did not look out of place at the elite level, even if he was pushed off the ball too easily at times. St Kilda got out to a 13-point lead midway through the second term after a run of three straight goals that included a brilliant 55m supergoal from Jack Billings. With their young midfield purring, the Saints looked like they could run the more seasoned Roos off their feet on a day when the temperature nudged 30 degrees. However, the Roos hit back with the last three goals of the term to go to the main break with a six-point lead, and then powered away with a seven-goal-to-one third term that effectively killed the contest. 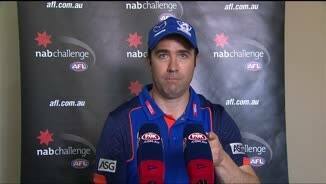 North coach Brad Scott said post-match that Saturday's game had been an ideal first hit-out for his team. "I thought it was (played at a) really good intensity and I think you're looking for your team to bring intensity in the contest but if the opposition don't, then you probably don't get the hit-out that you want," Scott said. "I thought the Saints were really impressive particularly early with their pressure, some of their youngsters looked really keen to get out there and play after a long pre-season. "That gave us a really good contest, so I thought both teams would be happy." St Kilda assistant coach Danny Sexton, who was in charge in the Saints' coach's box on Saturday, was relatively happy with his team's performance save for the third term. "I thought it was good for the first half. North Melbourne are a really good team. They won two finals last year, so for our young and inexperienced team to go in a goal down at half-time we thought was positive," Sexton said. "We were disappointed with our third quarter. 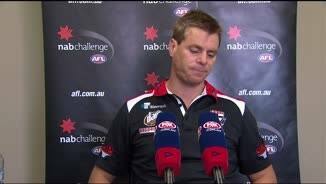 We lost the quarter by six goals, but we thought we gutsed it out pretty well in the last quarter." St Kilda: Former No.2 draft pick Jack Billings is set to spend more time in the midfield in his third season and showed in a second-quarter purple match just how damaging he could be. Billings was instrumental in the Saints' three-goal burst that put them 13 points up midway through the second term, the highlight a 55m super goal that went through post high. Seb Ross accumulated a lot of ball through the midfield in a sign St Kilda's on-ball depth is on the rise. North Melbourne: North's biggest injury fear would be ruckman Todd Goldstein going down with injury and the Roos got a good look at life without the 2015 All Australian on Saturday with understudies Majak Daw and Braydon Preuss handling the ruck duties. 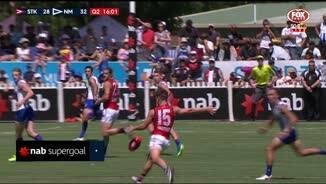 Daw, in particular, was impressive, particularly in the ruck contests, most memorably setting up the game's opening goal with a clever tap to Shaun Higgins. Second-year rookie Preuss also competed well enough to suggest North has enough ruck depth if Goldstein is sidelined at any point in 2016. Third forward Mason Wood also showed with three goals that he might be ready to cement a regular senior spot in his fourth season. St Kilda: Jade Gresham was the only one of the Saints' 2015 draftees to make his debut on Saturday and the midfielder gave glimpses of why St Kilda is so excited by the outside run and class he can add to their on-ball division, although at times he was brushed off the ball by North's hardened bodies. Key-position rookie Nick Coughlan took just one mark from eight touches. North Melbourne: Ryan Clarke was the most impressive of the Roos' debutant, showcasing his ability to mix it on the inside and in the open through the midfield. 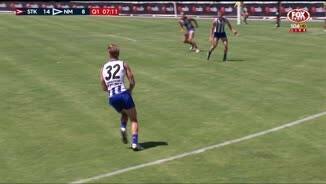 North's second pick in last year's national draft burst through the centre late in the first term and set up a Drew Petrie major on the goal-line with a long bomb. Clarke then won the next centre clearance, prompting commentator Terry Wallace to tell Croc Media listeners: "North Melbourne you've found one already." Former Hawk Jed Anderson gave glimpses of why North chased him so hard in last October's trade period, taking a strong contested mark in the second term and coolly converting a set shot from 35m. First-year forward Corey Wagner had a quiet first outing for the Roos, but set up a Brent Harvey goal with a well-weighted long pass late in the third term. St Kilda: The Saints have a week's break before they venture to Mackay to take on the Brisbane Lions on Sunday, March 6. Key players Nick Riewoldt, Leigh Montagna, David Armitage and Sam Fisher were rested against North and could return against the Lions. North Melbourne: The Roos also have next weekend off, with their next clash against Collingwood in Wagga Wagga on Saturday, March 5. Stars Todd Goldstein, Daniel Wells and Nick Dal Santo should return against the Pies after being rested against St Kilda, while North is likely to rest other stars before playing a near full-strength team against Hawthorn in their final pre-reason clash. Official crowd: 6216 at Norm Minns Oval.